Created following the current Mojo Monday Sketch #400. Thank you for stopping by today! I love hearing from you! Loved the Father's Day cards & patriotic card too! Hi America what a beautiful card I love the colours and the flower's are gorgeous. Such a truly decadent card! Love it! Thanks for linking up to Mojo Monday again! This is a wonderful interpretation of the sketch! 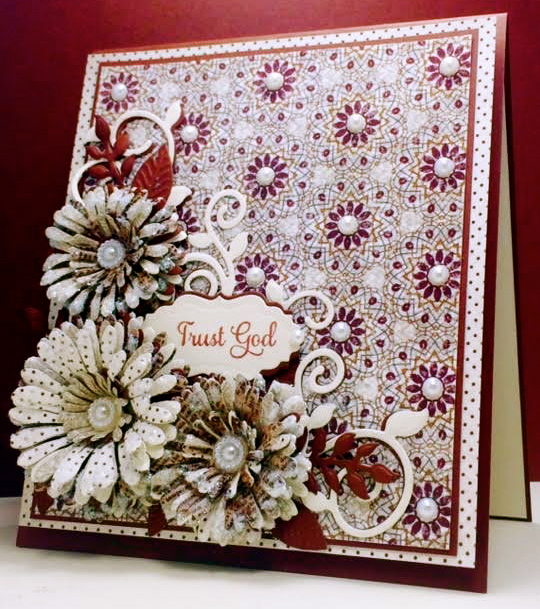 The flower and flourish grouping is awesome and that background paper is a wonderful elevating element! Nice design work! Thanks for dropping this off by our house at 613 Avenue Create! What a beautiful stunner this card is, America. Love how you used the sketch, and your flowers are lovely. Thank you for playing along with our Challenge at Creative Craft Cottage. Wow ! Gorgeous card !You did great with this sketch ! Your flowers are stuning , great design , well done ! Thanks for joining us at CCC challenge and good luck ! Beatyful card! Thank you for joining us at Crafts Galore Encore for the June's Anything goes challenge.